Every fly fisher knows what to wear when you wade the river. The Simms and Cabelas’ models have shown us. We need to don a pair of chest waders and pull on our wading boots. But sometimes, the conditions dictate another approach. 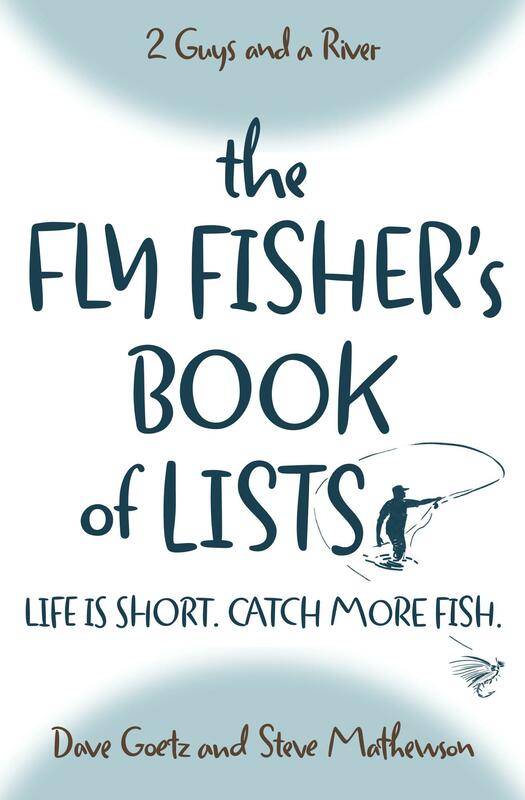 If you’re new to fly fishing, here is a guide for when you wade the river. This is the default approach. A good pair of chest waders will keep you dry and warm as you wade a cold river. They will also keep you safe if you fall in, provided you use a wading belt. Please, don’t leave home without a wading belt! Some fly fishers tell us they use two for added protection. A wading belt seals the waders around your waist or chest so that they cannot fill up with water and weigh you down. A good-quality pair of wading boots are a must, too. This is where it gets a bit tricky because the best sole for traction is felt (in my opinion). But conservation-minded fly fishers frown on felt because it can trap the microorganisms and thus spread invasive species as a fly fisher moves from one river to another. So I don’t use felt, ever. Frankly (and unfortunately), rubber-soled alternatives do not work as well as felt. But Dave, my podcast partner, and I are sold on Patagonia Foot Tractors (we receive no kickback for recommending them). The aluminum bars on the sole really do provide good traction. But you’ll want to wait until you get to the river to put them on. Your local fly shop will appreciate you for waiting — especially if the shop has hardwood floors; the aluminum bars are meant to dig into bottom of the river. So when should you wear chest waders and wading boots? The most obvious answer is any time you will be wading in water above your thighs. By the way, the term “chest waders” does not demand that you wade in chest-high water. I highly recommend that you do not do this for the sake of safety. You can also wear chest waders if the weather is cold or cool — even if you’ll will only wade in ankle deep water. You could “layer up” with other kinds of clothing, but if you sit on the bank in the early morning when the dew is on the ground, you’ll be thankful for your waders. And obviously, you always using your wading boots with your chest waders. Sometimes, though, the weather is too hot for chest waders. We wish a large gentleman we saw a few years ago would have gotten this memo. He was fishing a spring creek on an 80+ degree day and was wearing chest waders. There was no need to wade the little creek except to cross it at a few points (in ankle deep water). No need to sweat profusely. One alternative is waist waders plus your wading boots. This works well if you want to stay dry but want to avoid over-heating. I ordered an inexpensive pair from Cabela’s and they seem sturdy enough. I’ve wondered if waist waders provide a safety risk to those fly fishers who wade into thigh-deep water. Could they fill up with water more easily if you slip and fall in the river? I suspect that the belt around your waist would keep them from filling up with water. But I haven’t fallen in with my waist waders (only while wearing my chest waders! ), so I’m not certain about this. If it is a hot day in the summer, wet wading is an alternative. I’ll talk about clothing alternatives in a moment, but this means your clothing will get wet — yes, soaking wet. Footwear for wet wading is either wading sandals, wading shoes, or your wading boots. I prefer a pair of Simms wading shoes. They are light. The downside, of course, is the rubber soles (see above). Some older wading sandals have felt soles, but these are going the way of cassettes, VHS, and CDs (for the environmental concerns mentioned earlier). Wading boots work fine, although they are a bit heavier. If you wear wading boots without waders, you’ll want to use Neoprene wading socks. Almost all the major manufacturers of waders make these. However, don’t expect that these will keep your feet dry. I’ve never had a pair that really sealed around my calf so that water didn’t seep down into them. But these socks will keep your feel from slipping around in your boots — even if your feet get wet. While we’re on the topic of wet wading, let’s address clothing. One alternative is a pair of frayed, cutoff shorts, which you make from your worn-out jeans. Oh wait, it’s not the 1970s! A better alternative is a pair of nylon pants or shorts. Go to your local sporting goods store and buy the cheapest pair you can find. They work as well as the high priced wading shorts and pants you’ll find in your local fly shop. The reason you want nylon is because it doesn’t feel as heavy when it’s waterlogged, and it dries out fairly quickly. If you’re wondering how well jeans work, well, try it once. We guarantee you’ll never do it again! One is more exposure when you are fishing in areas where there are venomous snakes. We talked recently on a podcast about a fly fisher who got bit by a copperhead in Shenandoah National Park. Now we’re not guaranteeing that waders will protect you sufficiently (unless you can figure out how to make a pair out of Kevlar!). But loose waders and a pair of wading boots may protect you a bit more. A listener of our podcast also recently reminded us that wearing chest waders is a deterrent to ticks in the summer. Good point! Also, you can’t store your wallet, car keys, and cell phone in your pants pockets if you are wet wading. However, you’ll be relieved to know that neither Dave or I have discovered that our white legs scare away the trout when we wet wade in nylon shorts. Sorry to leave you with that image! Whatever you wear when you wade, wade safely. Great point, Jim. Wool socks are always a good idea. They deal with moisture so well. Also, you can’t store your wallet, car keys, and cell phone in your pants pockets if you are wet wading”. This is a great point, JC! I, too, use my vest when I wet wade. I always put my car keys and wallet and cell phone (for the camera) in a thick, sealed plastic bag before I put it in a vest pocket. I’ve been known to slip and get my vest wet as well as my pants!! Ok I broke down and bought a pair of hip waders . After searching for what I felt was a reasonable priced wader I came across a pair by Dryft. 239.00 free shipping. I tried them on today I’m really impressed. Quality seems to really good as well . For such a light wader they look and feel well built . So no more chest waders in 90 degree days for me lol . Good for you, David! No more white legs in ice water 🙂 Let us know how they work.